In image authentication watermarking, hidden data is inserted into an image to detect any accidental or malicious image alteration. In the literature, quite a small number of cryptography-based secure authentication methods are available for binary images. 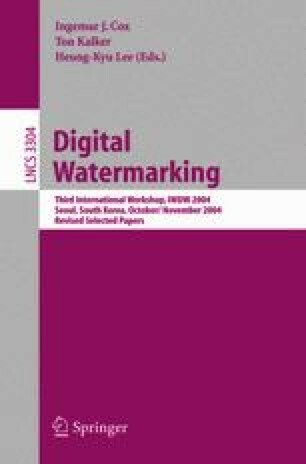 This paper proposes a new authentication watermarking method for binary images. It can detect any visually significant alteration while maintaining good visual quality for virtually all types of binary images (possibly excluding dispersed-dot halftones). As usual, the security of the algorithm lies only on the secrecy of a secret- or private-key. This paper also presents a variation of the proposed scheme that can locate the modified region with good spatial resolution. A possible application of the proposed technique is in Internet fax transmission, i.e. for legal authentication of documents routed outside the phone network.